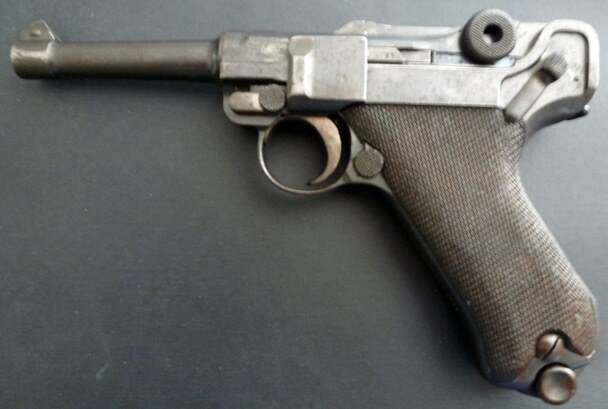 This specific pistol – a Deutsche Waffen- und Munitionsfabriken (DWM)-produced Model 1908 9mm Luger – was produced in March 1915. It has the serial number 3336 c. The weapon has a unit marking on the front grip strap of 88. R.M.G. 48. This marking corresponds to the 88th Infantry Regiment, specifically the Machine Gun Company. The last digits, 48, indicate that it was the 48th weapon in the company’s arms room, undoubtedly belonging to a machine-gunner. The 2. Nassauisches Infanterie-Regiment (2nd Nassau Infantry Regiment) was formed by the Duke of Nassau on August 13, 1808, when the Duchy of Nassau was an ally of Napoleon. It went to Spain, where it fought for the French in the storming of the Mesas de Ibor and the Battle of Talavera. In December 1813, after Nassau left the alliance with France, the regiment fought on the side of the allies against Napoleon. The unit fought at the key position of Hougoumont at the Battle of Waterloo. In 1848, it fought in the Baden Revolution and the following year fought against Denmark in the First Schleswig War. In the Austro-Prussian War of 1866, it fought with the southern Germany forces against Prussia. After Prussia’s victory, the regiment was incorporated into the Prussian Army as the 88th Infantry Regiment (Infanterie-Regiment Nr. 88.) In the Franco-Prussian War of 1870/71, the regiment fought at Weißenburg (August 4), Wörth (August 6), Sedan (September 1), Mont Valerien (January 19, 1871), and at the Siege of Paris from September 22, 1870 to January 28, 1871. After the war, the regimental headquarters was located at the Mainz Fortress, moving to Diez from 1894-1897. By a Prussian imperial order on September 19, 1913, King Konstantin of Greece was appointed to be the ceremonial head of the Regiment, so the unit received the K with a red crown for the their epaulets. The regiment was part of the 21st Infantry Division (Major General Ernst von Oven) was part of the XVIII Corps (Lieutenant General Heinrich von Schenk) at Frankfurt am Main. In August 1914, it was part of the Fourth Army (Duke Albrecht of Württemberg), entering Luxemburg on August 10 and Belgium on August 12. It fought at Neuf Château on August 20, at Bertrix and Orgeo on August 22, at Matton on August 24 and at Brévilly on August 26. The division crossed the Meuse River on August 28. During the month of September 1914, the 21st Infantry Division took part on the First Battle of the Marne between Vitry-le-Francois and Sermaize-les-Bains. It then retired toward Rheims, where it fought northwest of the city from September 15 to 20. In October, it was reassigned with the XVIII Corps to the Second Army (Field Marshal Karl von Bülow) and was located at Roye. The 88th Infantry Regiment remained with the 21st Infantry Division at Roye until March 1915, when it transferred to help form the 56th Infantry Division. The new division concentrated near Vouziers and then went south of Ripont on the Champagne Front in April. In early May, the 56th Division moved to the Eastern Front as the reserve for the Eleventh Army. The 56th Infantry Division participated in the combined German-Austrian Gorlice-Tarnów Offensive in late May, initially as the army reserve, at the Battle of Jaroslav on May 18 and the Battle of Rudka on June 18, suffering heavy losses in both. The division also fought in the breakthrough at Lubaczow and the Battle of Lemberg, ending on June 22. At the end of June 1915, the division was transported back to the Western Front to Valenciennes, forming part of the high command reserve in the Second Army and later in Army Detachment Falkenhausen. 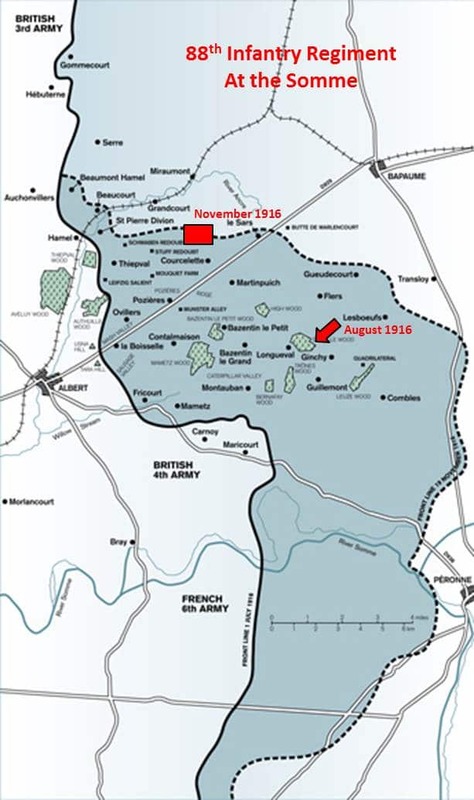 The division saw action from September through November 1915 in the Second Battle of Champagne, initially in the sector of Maison de Champagne, as part of the VIII Reserve Corps (Major General Friedrich Fleck) at Aure. Infantry losses alone in the division during the battle were 107 officers and 5,968 men. It remained in the trench lines at Champagne until April 1916, then went into reserve with the Third Army. On May 25, 1916 the division entered the Battle of Verdun, fighting in the struggle for the Dead Man’s Hill (le Mort Homme). The regiment reinforced le Mort-Homme, helped capture the village of Cumières, remaining at Verdun until July 17, 1916. German records classified the fighting of May 25-29 as the “Kämpfe um den Toten Mann” and the fighting from May 29-July 17 as the “Stellungskämpfe auf dem Toten Mann.” The division then moved north to the Flanders and Artois sectors of the front and remained there until August 23, 1916. The division joined the Battle of the Somme the following day; it would fight near Ginchy at Delville Wood, until September 9 launching a bloody counterattack northeast of the woods on August 31 against the British 7th Division. The 56th Division returned to the final phase of the Battle of the Somme on November 13 near Pys under the command of the German First Army. On the south bank of the Ancre valley, the 56th Division was relieving the 58th Division on November 18 as the British began their attack that would later be known as the Battle of the Ancre – the final large British attack of the Battle of the Somme. The German positions began 300 meters north of the British “Regina Trench” at Alter Dessauer Riegel (Old Dessau Defense Line), which was held by patrols as a decoy away from Dessauer Riegel – Leipziger Riegel (Leipzig Defense Line), the main line of defense 150 meters back in Kleine Mulde (Little Hollow), an eastern extension of Stallmulde (Barn Hollow.) Stallmulde was 650 meters south of Baum Mulde (Tree Hollow.) Some 100 meters behind these defenses lay Grimmaer Riegel (Grimm Defense Line,) which the Germans were able partly to reinforce before November 18. The last line of defense was Grandcourt Riegel (Grandcourt Defense Line) and machine-gun nests along Baum Mulde. The British attack, in frigid weather made worse by sleet, got forward 550 meters beyond Beaucourt, despite many casualties caused by massed German machine-gun fire and local counter-attacks. By the evening, German defenders held ground either side of the Pys-Courcelette road, in an arc between Dessauer Riegel and the east end of Regina Trench. The division remained in positional warfare along the Somme and in Flanders until March 15, 1917. It then faced the British offensive at the Battle of Arras in April and May, and then after more time in the trench lines in Flanders, Artois and the Argonne, it returned to Verdun on August 13, 1917 at Chaume Wood-Baumont and Cheppy Wood. The division remained at Verdun until April 16, 1918, and then returned to the Flanders region. In 1918, the handwriting was on the wall for the German Army unless it took to the offense. The spring offensive, known to commanders as the “Kaiserschlacht” (Kaiser’s Battle), began with an effort in the north to drive a wedge between the British and French Army sectors at La Fère, southeast of Saint-Quentin, France, commencing March 21. As weather conditions began to improve after the winter, a second phase of the offensive, codenamed Operation Georgette in the German plan was the start of the Battle of the Lys. The offensive was launched against the Allied line in the low-lying, British-held sector on both sides of the Lys River in French Flanders. At 02:30 hours on April 25, 1918 over 250 batteries of German guns of the Fourth Army opened up on Allied artillery positions of the British First Army with a mixture of gas and high explosive, marking the beginning of the Second Battle for Kemmel. For the next two hours they concentrated solely on destroying gun emplacements. After a short pause, at 05:00 hours the German barrage was switched to the French front line. Opposite a single French division (which had relieved British units at Kemmel Ridge) were amassed three and a half German divisions, including the 56th Division. An hour of such a furious bombardment was considered sufficient by the Germans and at 06:00 hours they launched their infantry to the attack. By 07:10 hours, the 56th Division had captured Kemmel Hill, southwest of Ypres, Belgium. The division continued to fight in Flanders near Ypres in the vicinity of the Yser and Lys Rivers as part of the German Fourth Army (General Friedrich Bertram Sixt von Arnim.) It ended the war in battle before the Antwerp-Maas defensive line. From December 26-31, 1918, the regiment demobilized at Bad Orb. In total during the war, the division spent thirteen months at Verdun, as well as heavy fighting along the Somme, in the Champagne region and north in Flanders. Total killed in action in the 88th Infantry Regiment from 1914 to 1918 were 127 officers and 3,934 enlisted men. Commanders of the 56th Infantry Division included Major General Hans Schach von Wittenau (until June 30, 1915), Major General Leo Sontag (until April 22, 1916), Major General Karl Franz von Wichmann (until July 2, 1918) and Major General Helmuth von Maltzahn. One of the strongest forces militating toward adoption of the machine gun in German service was Kaiser Wilhelm II, well-known as a technophile with a strong interest in modern weapons. Throughout the testing period, the Kaiser exerted his influence to overcome the hidebound indifference to automatic weapons within the Prussian Army’s command levels. During the period of the Second Empire (1871 – 1918,) Germany was composed of quasi-independent states, each of which, while having an overall fealty to the Kaiser, fielded its own armed forces. As a result, the German forces in World War I actually consisted of the armies of the various states, including those of Prussia, Bavaria, Württemberg and Saxony. Of these, the Prussian Army was by far the largest, and in wartime the armies of the smaller states were subordinated to the Prussian General Staff. Kaiser Wilhelm II had long championed the Maxim gun as the best available automatic weapon. Despite this royal patronage, things moved very slowly. The Imperial General Staff of the 1890’s was heavy with officers who had fought the Franco-Prussian War of 1870. 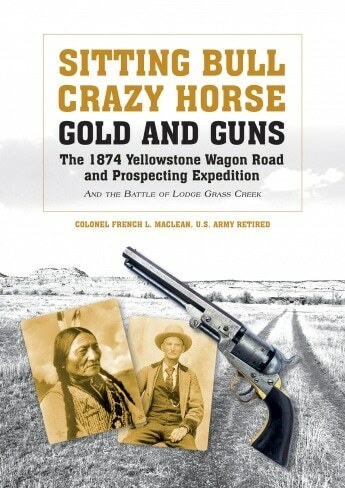 Their experiences led the General Staff to a collective belief that the machine gun was of use only within certain narrow tactical parameters (such as fortification defense or colonial warfare against poorly armed and led native hordes.) Kaiser Wilhelm II thought differently; and the Kaiser would be proven correct. Machine guns quickly proved their worth and within a year, the Supreme Command decided that each infantry battalion would have its own machine gun company, in addition to the regimental machine gun company, although fielding the guns in sufficient numbers took an additional year. When the war began in August 1914, approximately 12,000 MG 08s were available to battlefield units; production, at numerous factories, was however markedly ramped up during wartime. In 1914 some 200 MG 08s were produced each month; by 1916—once the weapon had established itself as the pre-eminent defensive battlefield weapon—the number had increased to 3,000; and a year later to 14,400 per month. The Model 1908 (Maschinengewehr 08) was an adaptation of Hiram S. Maxim’s original 1884 Maxim gun. The weapon was so-named after 1908, its year of adoption. It could reach a firing rate of up to 400 rounds per minute using 250-round fabric belts of 7.92x57mm ammunition, although sustained firing would lead to overheating. The weapon was water-cooled using a jacket around the barrel that held approximately one gallon of water. Using a separate attachment sight with range calculator for indirect fire, the MG 08 could be operated from cover, such as on the reverse slope of a hill. Additional telescopic sights were also developed and used in quantity during the war. Above is the Deutsche Waffen- und Munitionsfabriken (DWM)-produced Model 1908 9mm Luger made in March 1915. It has the serial number 3336 c. It has a mismatched magazine that has serial number 2689. Below is the front strap with the unit marking of 88. R.M.G. 48.